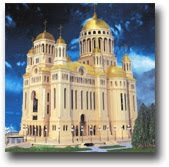 The Church of the Holy Trinity in Djakovica was completed in 1999 on the foundations of a five-dome memorial church. The previous church on this site was built as a mausoleum for all killed, murdered and frozen soldiers in the wars of 1912-1918. This church was completed in 1940. 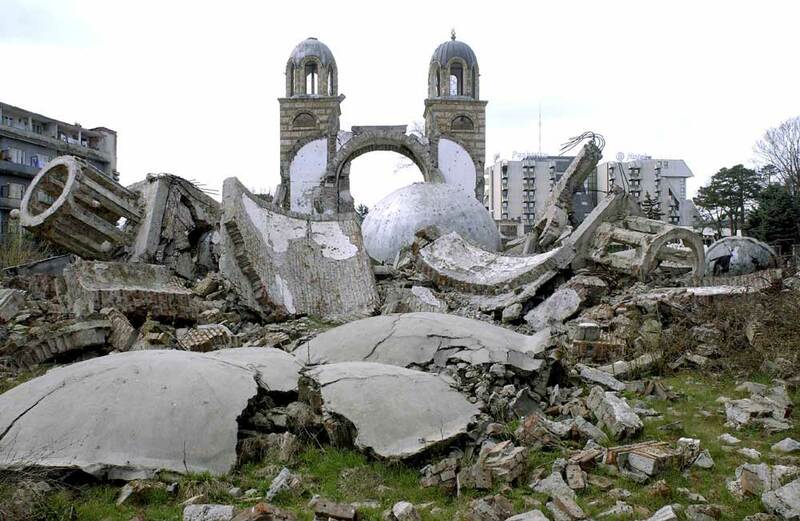 But in 1949, on St Sava's Day, the memorial church was destroyed by atheists. Fifty years after, the same happened to a new shrine, which was first desecrated, then set ablaze, mined and finally completely destroyed on 24/25 July 1999. 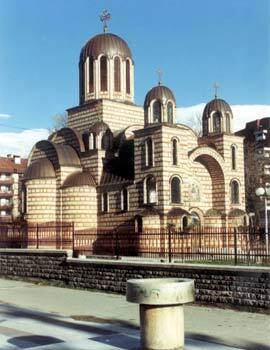 The Djakovica cathedral was one of the most beautiful recently built churches. Several different types of the ground plan were combined in the interior organization of the space. The basic structure was in the form of an inscribed cross. The cathedral had a central dome and four smaller domes in the corner, lower bays. In this way a spiritual connection with the largest church of the SS Archangels Monastery near Prizren, was achieved. Additional side spaces gave to the church the form of a free cross which followed the pattern of the great early Christian churches, especially the churches of St John in Ephesus and the Holy Apostles in Constantinople built by Emperor Justinian. Side apses were added to transversal brackets whereby a continuity with Knez Lazar's medieval architectural style was successfully established. The architects of the church were Ljubisa Folic and Radomir Folic. yep..thats true, an destroyed church made in milosevic. We enjoyed our time in ephesus and very happy with the tours we joined. We saw many interesting places. Thank you very much for your effort and great service. It is a wonderful place with wonderful people. I had a great stay in Istanbul and Ephesus. I was given a nice room by the hotel and people were very polite at the front desk and they were smiling all the time so i felt fine. It was an excellent tour to Ephesus www.privatetoursinistanbul.com House of Virgin Mary. Ephesus was really amazing. Our guide was also very knowledgeable and he asked us to determine our preference before he started to tour. Also I would like to say that i made the reservation by e-mail a couple of days before the date of tour and it worked well. I was picked up from the hotel on time and taken to airport for my early flight and I joined the tour in Ephesus I will definitely come back to turkey and will visit the other places. Thank you very much.